DESPITE BEING DRY AND VERY WARM AGAIN DURING THE BLOOM SEASON, WE MANAGED TO GET A FAIR AMOUNT OF SEED MADE. WE HAVE THEM PRICED AT BARGAIN RATES. MANY OF THE SEEDS OFFERED HERE ARE FROM OLDER POD PARENTS THAT WE HAVE ESTABLISHED CLUMPS OF. THE FACT THAT THESE PLANTS ARE OLDER MEANS THAT THEY HAVE PERFORMED WELL IN OUR ZONE 5 GARDEN AND THEY ARE VERY GOOD PARENTS. GENERALLY SPEAKING, THESE SEEDS ARE FROM POLLEN PARENTS THAT ARE NEW INTRODUCTIONS AND SOME ARE FROM PLANTS UNDER OBSERVATION HERE THAT ARE LIKELY FUTURE INTRODUCTIONS. ONE OF OUR INTRODUCTIONS, SHADOW CHASER, IS PICTURED HERE. THE PRICE QUOTED IS FOR A PACKET OF 5 SEEDS. OUR SEEDS WERE PRODUCED IN OUR GARDEN. AFTER DRYING,THEY ARE STORED UNDER REFRIGERATION UNTIL PLANTED OR SOLD. WHILE WE RECOGNIZE THERE ARE MANY POSITIVE REASONS FOR GREENHOUSE PRODUCTION, WE LIKE TO KNOW THAT AT LEAST ONE PARENT IS HARDY HERE IN ZONE 5. UNLESS OUR SEEDS HAVE TWO 2018 INTRODUCTIONS AS PARENTS, YOU KNOW THAT AT LEAST ONE PARENT CAN HANDLE COLD WEATHER. SHIPPING WILL BE BY USPS FIRST CLASS MAIL. WE SHIP ON MONDAYS AND WEDNESDAYS. SEEDS ARE SHIPPED IN ZIPLOC BAGS ROLLED IN BUBBLE WRAP AND SENT IN A PADDED MAILER. SHIPPING FEES ARE $3 FOR UNITED STATES ORDERS, CANADIAN ORDERS ARE $9 AND $13 FOR INTERNATIONAL ORDERS. YOU MAY COMBINE SHIPPING WITH LILY AUCTION PURCHASES. WE STRIVE TO MAINTAIN AN UP TO DATE INVENTORY, BUT PLEASE CHECK WITH US BEFORE REMITTING PAYMENT. BE SURE TO CHECK BACK HERE FREQUENTLY AS WE WILL MAKE ADDITIONS TO THE INVENTORY. 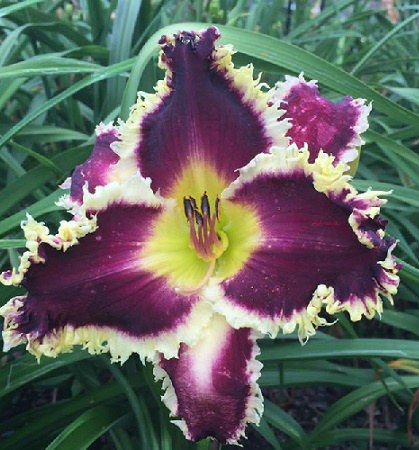 NORMALLY, WHAT I CONSIDER SOME OF OUR BEST OFFERINGS WILL COME LATE IN THE SEASON WHEN I RECONCILE MYSELF TO THE FACT THAT I DON'T HAVE THE SPACE OR THE ENERGY TO PLANT ALL OF MY KEEPERS. ORDERING IS SIMPLE. EMAIL US THE CROSS NUMBER AND THE DESIRED NUMBER OF PACKETS. WE WILL CONFIRM YOUR ORDER AND PUT A HOLD ON YOUR PURCHASES FOR 7 BUSINESS DAYS. IF PAYMENT IS NOT RECEIVED IN THAT TIME FRAME, THE ORDER WILL BE PLACED BACK IN INVENTORY. WE WILL SHIP WHEN PAID FOR UNLESS YOU REQUEST US TO HOLD THEM. THE PRICE LISTED IS FOR A PACKET OF 5 SEEDS. IF YOU NEED PLANT DESCRIPTIONS OR PICTURES FOR ANY OF THE PARENTS, PLEASE CONTACT US.